Already its mid-September and I’m finally making my first post of the year, I apologize for the wait! I figured that it’d be good to give a quick recap on what I did over the summer. Last year I applied to the Lee Iaccoca International Internship program here at Lehigh. I applied for a research internship at University of Science and Technology of China (USTC) and was lucky enough to get one of the four spots available. 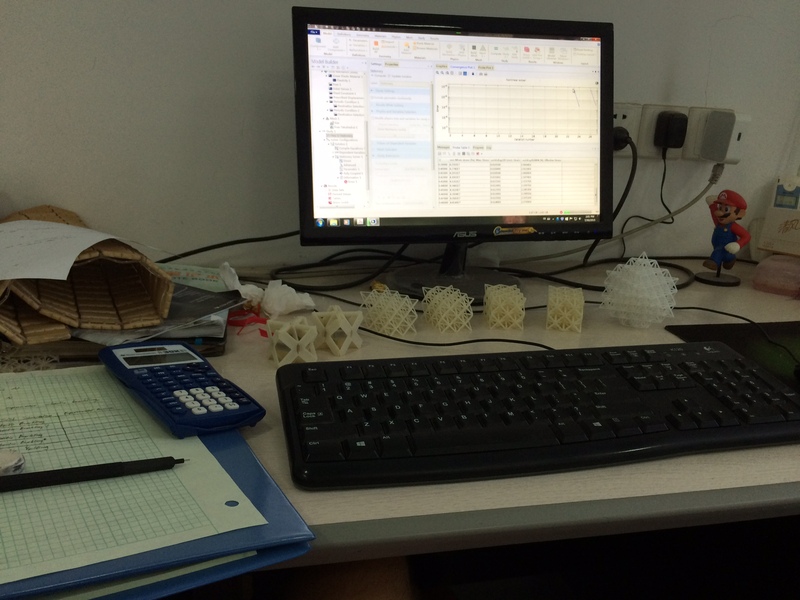 So this past summer I spent six weeks in Hefei, China where I worked with two other undergraduate Chinese students at USTC. Along with me, three other students (pictured above) from Lehigh traveled and did research projects of their own. Over the trip we all became close friends. My project focused on the octet-truss lattice material (pictured above). We were interested in being able to predict the different failure method the lattice would produce (plastic yielding vs. Euler buckling) under a compressive load based on the geometry of the individual trusses. After conducting a literary review we were able to come up with a formula that enabled us to input the geometry of the unit cell and truss parameters and it would return a value that would tell us what kind of failure method to predict. From here we modeled five different unit cells in SolidWorks, varying the radius of the truss members. Based on our equation,we wanted three of these models to exhibit Euler buckling failure and two to exhibit plastic yielding. From here we imported the models into a finite element analysis software called COMSOL Multiphysics where we ran computer simulations of a compression test. Our results from these simulations displayed exactly what we wanted. From here we then 3D-printed some physical models (pictured above). 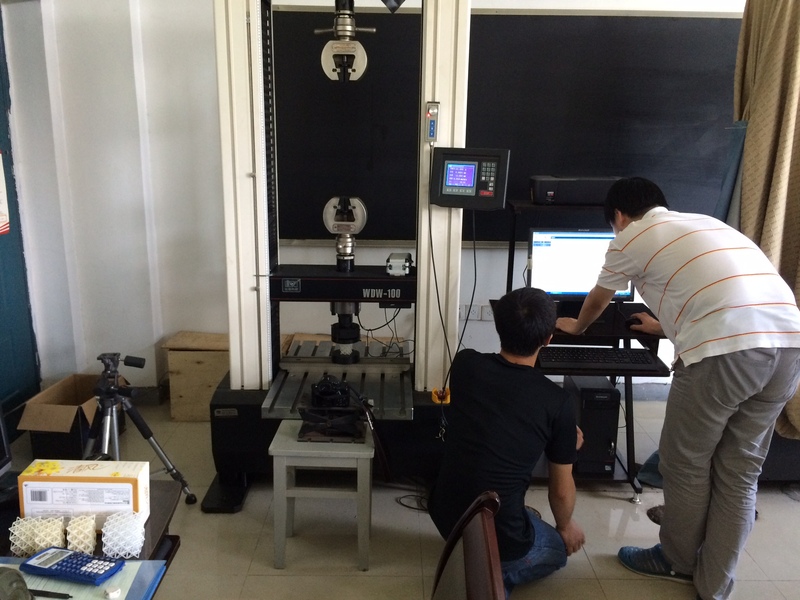 We then used a WDW-100 material universal testing machine to physically compress our models. We recorded video of the tests and observed that four of our models actually exhibited Euler buckling instead of the three that both our equation and computer simulation predicted. I chalk up the error due to the fact that we weren’t able to get certain information like Young’s modulus, density, etc. from the manufacturer of the ABS plastic the 3D printer used. We used values from generic data sheets found online. Differences in these values could have affected our equation and computer simulations. Regardless, we were still able to accurately predict what kind of failure to expect which I think is pretty cool. Overall it was an amazing experience. Every weekend we had the opportunity to travel on USTC’s budget. 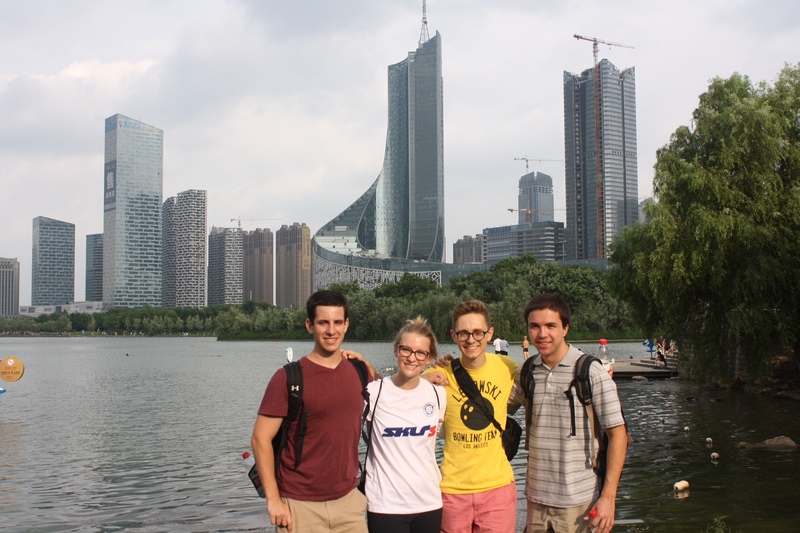 We stayed in Hefei but got to visit Wuhu, Nanjing, Beijing, Shanghai, and Huangshan. There was a great balance work and travel and it still amazes me that I didn’t have to pay a penny for the whole experience. It gave me some great research experience and now I’m excited to use it when I’ll hopefully get an internship this upcoming summer.